Amy Ouimette started writing professionally in 2011, specializing in infectious diseases, immunization, sexual health, child health, nutrition and weight loss. She a Public Health Nurse who has been practicing nursing for over seven years. Ouimette holds a Bachelor of Science in Nursing from Laurentian University. There is nothing scarier for parents than watching their child choking and gasping for air. According to the New York State Department of Health, choking ranks fourth among the leading causes of unintentional death in children 5 and under. At least one child in the United States reportedly dies from choking every five days, the agency says. In most cases, choking is preventable. 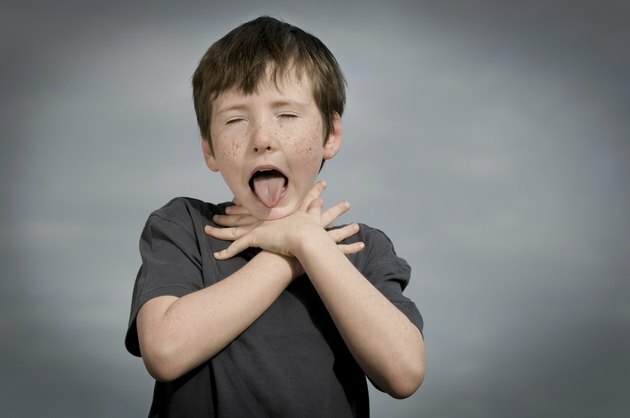 Choking occurs when a foreign object blocks the airway, causing the inability to breathe. An obstructed airway can quickly lead to severe complications, including brain damage and death. According to the American Academy of Pediatrics, children under 3 are especially at risk of choking due to the fact that they have a small airway and a more difficult time chewing and swallowing food. Small children also tend to put things in their mouth. In the United States, the Child Safety Protection Act requires warning labels on packaging for toys containing small parts. A tool called the small parts test fixture is used to measure toy parts. It is a cylinder tube that is 1.25 inches in diameter and between 1 and 2.25 inches deep. It is designed to mimic a child's mouth and pharynx. Any object that fits in the tube is considered a small part and must have a label on its packaging indicating it is a choking hazard for small children. The food responsible for the most deaths caused by choking is hot dogs, according to the American Academy of Pediatrics. This is due to the fact that hot dogs are shaped like the pharynx and, if one gets into the airway, it completely blocks it. Other foods that commonly cause choking are popcorn, peanuts, grapes, hard candy, marshmallows and raw carrot sticks. Toys that often cause choking include marbles, balloons and balls with a diameter of less than 1.75 inches. To help prevent choking, children should never be left unattended when eating. They should eat sitting straight up. Foods that have a tendency to cause choking should be avoided or cut into pieces before being served to small children. Children under 3 should not be allowed to play with toys with small pieces. Older children should be supervised when playing with these toys. The New York State Department of Health recommends that all parents learn how to perform cardiopulmonary resuscitation and abdominal thrusts, also known as the Heimlich Maneuver. What Should I Do If My Child Swallowed a Whole Peppermint?